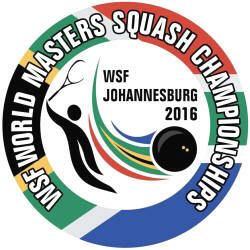 A record 951 players will compete in the 2016 World Masters Squash Championships in South Africa this month, according to the draws for the events published by the World Squash Federation. The biennial event, launched in 1983, will take place in Johannesburg from 24-30 September - featuring 19 men's and women's events, from Over-35 to Over-80. The main venues will be The Wanderers Club and the Parkview Squash Centre, with additional venues added to deal with the record entry. 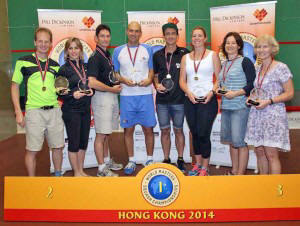 Title success is expected to be spread across 10 nations, with England and hosts South Africa predicted to win four gold medals each - Englishman Adrian Wright, the top men's O75 seed going for a fourth World Masters title and compatriot Ann Manley, the women's O75 favourite, bidding for a third. South African Craig van der Wath, top seed in the men's O50 event, has his sights on a fifth World Masters gold medal, whilst his partner Angie Clifton-Parks is bidding for a third crown. Egypt, such prolific winners, have former world No.13 Mohammed Abbas installed as hot favourite for the men's O35 event. Five-time world champion Sarah Fitz-Gerald leads the Australian charge in Johannesburg, seeded to retain her O45 trophy and collect a third World Masters title. 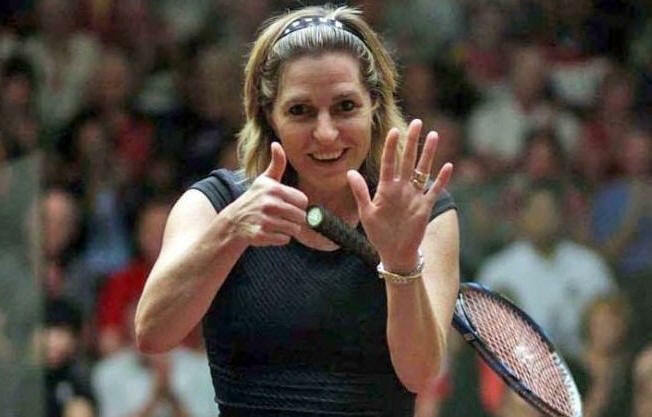 Meanwhile, former world number one Natalie Grainger is strong favourite to retain the women's O35 title she won last time in Hong Kong, while her father Chris Grainger is second seed in the men's O65 category and mother Jean Grainger will be bidding to defend her women's O70 title from a position of fourth seed. Included in the squad will be former World number one, Sarah Fitz-Gerald, and several former World Masters title holders. From the very first World Masters in 1976, whenMal Buck won the men’s over 45 title, Australia has been easily the most successful nation. Australia has won 30 men’s titles and 28 women’s, its 58 titles are comfortably ahead of England’s 49 and South Africa’s 39 crowns. Included in this year’s squad will be Brian Cook, who won his first ever World Masters Title in the over 45 division in 1995, and has since gone on to win titles in 2005 (55+), 2008 (60+), and 2014 (65+). Cook will be the top seed in the men’s 65+ as he chases his fifth World Masters title. 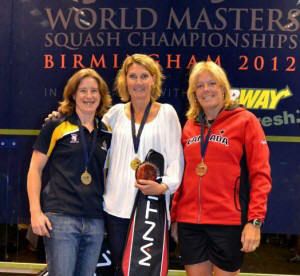 The biggest names in Australian women’s squash have won World Masters titles, including Heather McKay (four titles), Vicki Cardwell (three) Sarah Fitz-Gerald (twice) and Michelle Martin (once). Of those only Fitz-Gerald will be competing this year, and having won the 45+ division in Hong Kong in 2015, will look to defend that title in Johannesburg. Australia’s oldest competitors this year will beKevin Beatty, Tom Slattery and Peter Zilmer, all competing in the men’s 75-79 age division. Australia’s oldest female competitors will be in the 65-69 age group, with Laney Lashbrook-Gough, Jane Mackie and Marilyn Kennedy all competing. Also in this year’s squad will be the husband and wife combination of Cheryl and Maurice Tait. The World Masters Championships have attracted almost 1,000 players from throughout the world, and will be contested in Johannesburg from September 24-30.